#Wickoftheweek this week is the Wood Wick 'Fireside' candle. If you don't recognise these candles by their name, you will most definitely have heard of them as the candles that crackle when they burn. They also have quite interesting shapes. 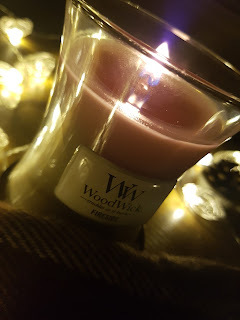 Woodwick candles are made from a soy blend wax, which is definitely better than paraffin wax! Fireside is a gorgeous grey/brown colour and is the brands signature fragrance. The cold throw is a pretty intense woody scent with a slight hint of musk. When burning (hot throw) the candle is gorgeous, it's definitely quite a strong scent though, so maybe not great for those of you who like a subtle fragrance but you can really smell the amber and oak as it burns. Although these particular ones have a burn time of around 100 hours, it's recommended that you only burn candles for a maximum of 3 hours at a time, if the candle has been made correctly using the correct scenting oils and wax, they will continue to scent the room after they are extinguished. The one thing I think is missing in the scent of Fireside is the burning smokiness of a fire, I honestly feel that would make this candle perfect! The last thing I absolutely need to mention is the sound, there's something quite soothing about the crackle these candles make, it's quite cosy and very comforting on a cold, autumn evening.